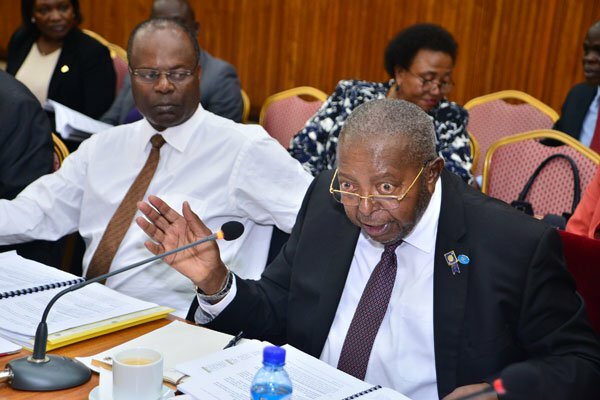 PARLIAMENT – Emmanuel Mutebile, Governor Bank of Uganda has said that the Central Bank has never dreamed of opening any of the seven defunct Banks that were closed by the Central Bank. Mutebile made the revelation in response to a question posed by Odonga Otto, (Aruu County) who had asked the Governor if the Central Bank had plans of reopening Teefe Bank. The Governor made the remarks while appearing before the Parliamentary Committee on Commissions, Statutory Authorities and State Enterprises (COSASE) that is currently carrying on a probe into the closure of the Seven defunct Banks. The question followed the discovery by the Committee that the then Minister of Finance, Mayanja Nkangi had authored a letter on 4th November 1993 ordering for the closure Teefe Bank, despite the legal instruments entrusting such powers in the Central Bank, not the Minister. As to date, the Central Bank has closed a total of seven Banks that include; Teefe Bank in 1993, International Credit Bank Ltd in 1998, Greenland Bank in 1999, The Co-operative Bank in 1999, National Bank of Commerce in 2012, Global Trust Bank in 2014 and the sale of Crane Bank Ltd to DFCU in 2016. The probe into the closure of the seven defunct Banks culminated from a letter by COSASE authored in November 2017, requesting the Auditor General, John Muwanga to undertake a special audit on the closure of these commercial banks by the Central Bank after the controversial closure of crane bank.